Just 50 years ago scientific journals dismissed Manuka honey as a “worthless and harmful substance”. In fact, few researchers were willing to take it seriously due to a belief that honey was merely an alternative medicine. Within the past few years however, new evidence has been turning opinions. Recently, Manuka honey been shown to posses benefits from helping wounds heal to fighting plaque and treating skin disease. What is Manuka honey? How does it work? 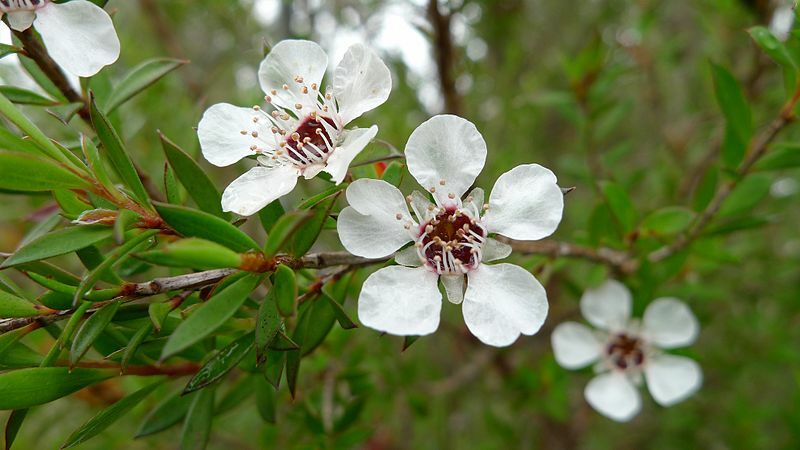 Manuka honey comes from the nectar of the plant group, Leptospermum, which includes the tea tree. These plants, native to Australia and New Zealand, contain a unique compound which reacts in honey to become the antibacterial chemical Methylglyoxal (MGO). Thanks to MGO, Manuka honey has been shown to kill a wide range of lab-grown harmful bacteria even when diluted. It’s important to keep in mind that your digestive system breaks down MGO. Odds are slim that eating Manuka honey will lead to any special benefits beyond the mouth and throat. Studies have shown that, in a petri-dish of harmful cells, Manuka can increase the effectiveness of treatments for cystic fibrosis and cancer. The human body is far more complicated than a plate of cells however. Because of digestion and other factors, these benefits often fail to translate over. While MGO is what makes Manuka honey stand apart from the rest of the supermarket shelf, it shares a few medicinal properties with other honey. Almost all honey contains some amount of hydrogen peroxide, a common disinfectant. The amount is safe for humans but often deadly to bacteria. Aside from this, a combination of inhospitable pH levels and high sugar content inhibit the growth of many forms of bacteria. It’s worth keeping in mind that Manuka honey is just one of several medicinal honeys out there in the world. There may be many more waiting to be discovered. Next time you get a cut or scrape, Manuka can help. One of the biggest dangers when dealing with open injuries is infection. Thanks to the MGO it contains, Manuka can stop the growth of over 50 common bacteria species known to infect wounds Most notably, Manuka honey is effective at stopping the growth of a some antibiotic resistant bacteria including MRSA. Many hospitals now offer a combination of Manuka honey and antibiotics as a standard practice. In fact, a growing number of Manuka products have been hitting the market and seeing more and more use in the health care system. While Manuka can often be cheaper than previous antibiotic creams, it’s best used in addition to them. Could Manuka honey fight plaque? It may seem a little counterintuitive but the answer is yes. In 2010 a group of researchers found that Manuka honey worked just as well chlorohexidine mouthwash, one of the best known methods for fighting plaque aside from just brushing. It’s worth noting that in this study participants coated parts of their teeth with the honey for 15 minutes, twice a day. Just eating this delicious treat normally isn’t likely to offer the same benefit. Manuka honey works by disrupting biofilms that cover plaque and allow it to adhere to teeth at the same time. A follow-up study from 2014 found that all honey actually has this ability, although manuka is even more effective. There’s good evidence to suggest Manuka has benefits for skin care, but they may not be as universal as some may hope. In 2016 a paper came out summarizing any known links between skin health and Manuka honey. One of the most notable findings was that it’s very effective at dealing with various forms of dermatitis, thanks to its anti-inflammatory effects. Manuka also proved to be an effective rosacea treatment. That’s the extent of what treatments have been found so far however. All hope is not lost for the potential of honey in skin care. Several in-vitro studies, carried out in the lab rather than within the body, showed there could be potential for future research. It has anti-inflammatory effects and can fight off a large number of bacteria and fungi known to damage skin. Infection by certain microbes in honey bees can be detected using light microscopy.